Often used in dams, bridges, piers, nuclear power stations and tall buildings, Hanging and Inverted Pendulum Systems are used to measure long term horizontal or rotational movement of structures. The Hanging Pendulum System's pendulum is hung from the measured structure and suspended in a tank of oil, the horizontal movement of the wire is measured by either Vernia Microscope or Automated Co-Ordinator. The Inverted Pendulum System uses the same principle, except it consists of a float suspended in water with a steel wire attached to the ground. Inclinometer Casing is used in conjunction with an Inclinometer or a string of In-Place Inclinometers to accurately measure ground movement. 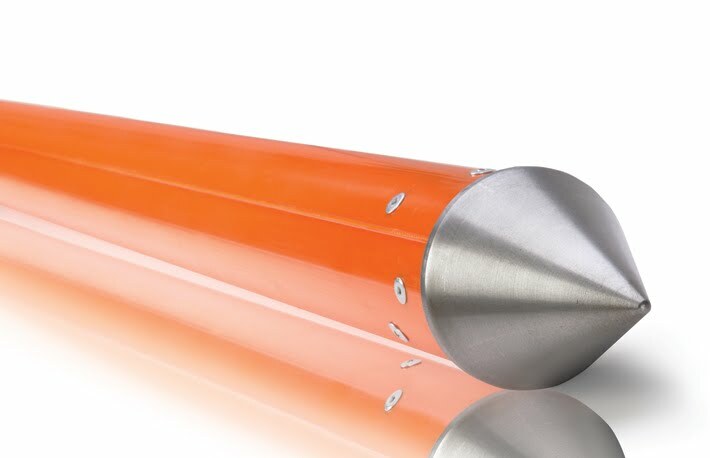 The casing is typically installed in a borehole, cast into concrete or attached to a structure with one of the grooves aligned in the expected direction of movement. 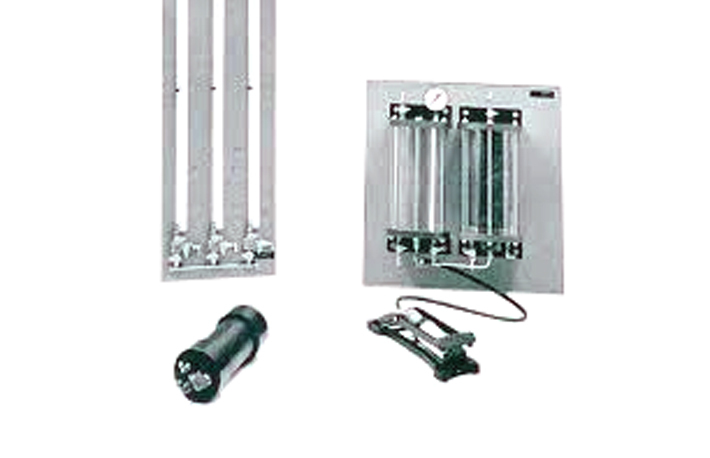 Inclinometer Casing can also be used to create a combined Inclinometer and Extensometer. 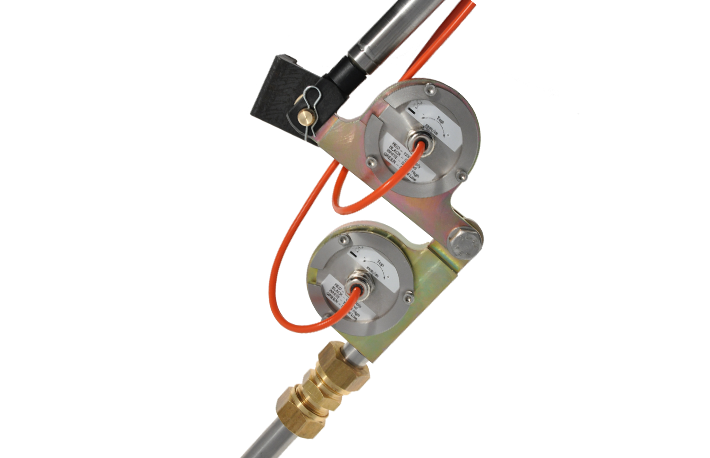 IPI and SIPI sensors are used to measure lateral movement of a borehole, used in a string of up to 40 sensors. The sensor are connected to a datalogger and set to take readings at regular intervals. The Digital Inclinometer System has three varieties, Vertical, Horizontal and Inclined. Vertical systems are used to measure lateral movement and deformation in soil and rock. Horizontal systems are used to measure heave beneath structures such as dams, embankments and landfill sites. Inclined systems work similarly to Horizontal systems, but they are primarily used in dams and embankments as they have a profile designed to be ideal for measuring inclined structures. 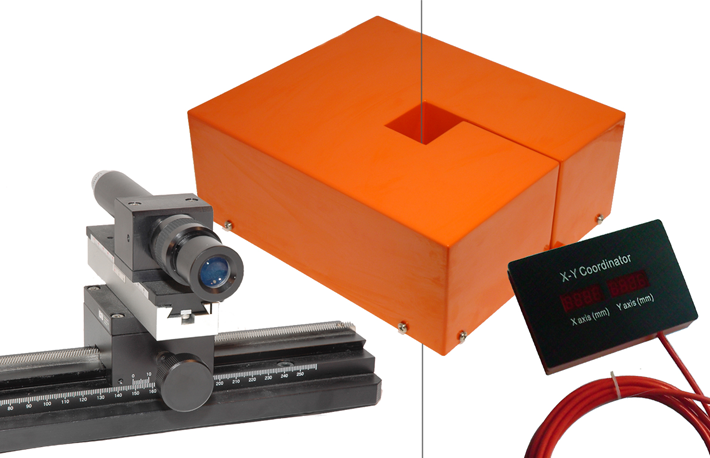 These systems can be combined with Inclinometer Casing and a Magnetic Extensometer to create a combined Inclinometer and Extensometer. 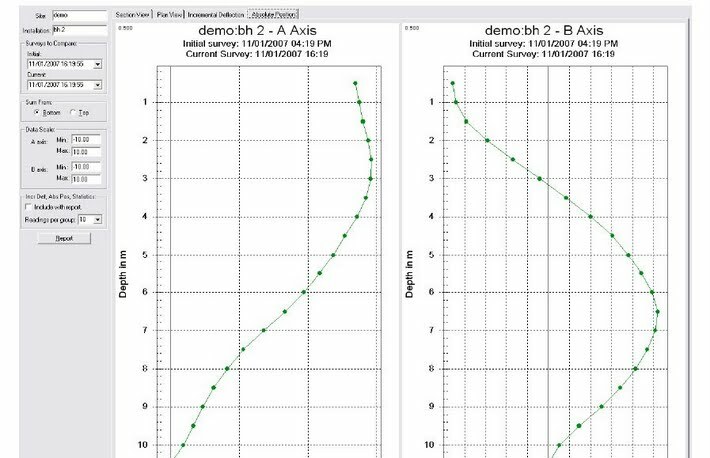 In-Site is Soil Instruments' Inclinometer Data Presentation Software. It is used to store and visualise Digital and Analogue Inclinometer data from many brands of Inclinometer. In-Site data can be viewed at any time, but a dongle (translucent green or blue in colour) must be plugged into the PC to import or graph data. Campbell Based Dataloggers utilise Cambell Scientific CR1000 and CR800 with added modules, power supply and communications. These dataloggers are custom built to order and suited to site specific requirements. Data is kept in ASCII format and is used with itmsoil's ARGUS software or a spreadsheet. The VWlog8 is a smaller, lower cost alternative to the Campbell Based Datalogger. It has 8 channels, each one of which can read one vibrating wire sensor and one temperature sensor. Settings are uploaded and data is retrieved remotely via a user owned FTP site. 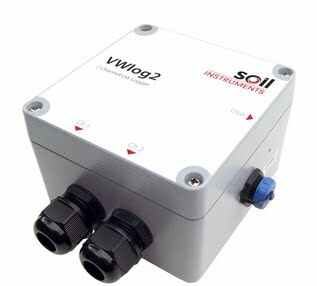 The VWlog2 is a simple, rugged, low-power, 2 channel Datalogger which reads most commercially available geotechnical and structural Vibrating Wire (VW) sensors and optional thermistor temperature sensors. VWlog2 contains a large internal memory of 4MB, enabling storage of up to 50,000 readings per channel. The internal memory operates as a USB mass storage device which is accessible through a mini USB interface, allowing data to be easily transferred to a PC or mobile device via drag-and-drop. 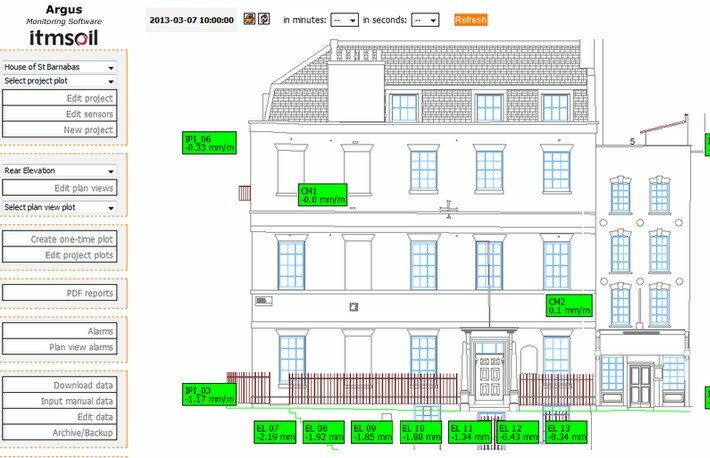 itmsoil's ARGUS is a web based software package for data management, calculation and presentation. It is used in conjunction with dataloggers that provide ASCII files with numerical data. ARGUS is primarily used to gather data autonomously from sensors and automatically monitor readings to user specifications. ARGUS is accessed from any internet enabled device and can accommodate a limitless number of sensors, it also allows manual input of data. The Milli-Amp Logger, or MAlog, is a low power, wireless, web enabled datalogger designed to read 4-20mA and pulse sensors. The logger can read 5 sensors at once; three 4-20mA sensors and two pulse sensors. Data is uploaded autonomously to a dedicated web portal. The MAlog is usually chosen due to the ease of installation and operation, as well as the long battery life (approximately 6 months on a standard battery). The unit combines a high capacity datalogger with an on-board GSM/GPRS Quad band modem. The logger runs on a single D-Cell Lithium battery and is housed in a compact, robust enclosure for reliable use in the field. Readings are stored on a local SD card and are transmitted in engineering units to any FTP site via the GSM/GPRS modem. Logger settings are easily configured by the user, allowing full control of settings and alarms, making the device completely adaptable to site specific changes. The Logger incorporates an intelligent ‘passive’ to ‘active’ alarm system with up to six user defined prioritisation thresholds, reducing battery consumption and an overload of needless data. The Vibrating Wire Mini Logger is used to monitor a single vibrating wire sensor. 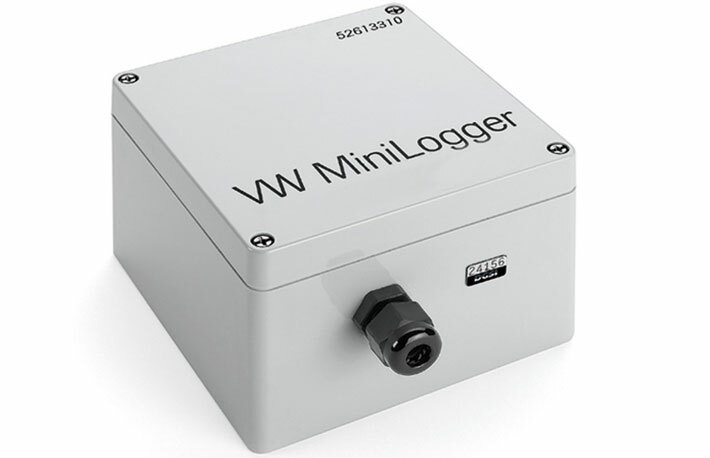 The Mini Logger is used primarily in small monitoring projects where larger dataloggers are inefficient and unnecessary, it is also used in larger projects to monitor important sensors while a more robust data logging solution is implemented. The Magnetic Extensometer is used to measure settlement and heave, primarily in dams, excavations, embankments and tunnels. The system uses a probe, which measures the movement of a number of magnetic targets, data from this system indicates the depth and amount of movement. This system can be combined with an Inclinometer and Inclinometer Casing to create a combined Inclinometer and Extensometer. The Digital Tape Extensometer is primarily used in tunnels and excavations to measure movement and deformation between two points. These two points are eyebolts attached to the wall of the measured structure. This instrument can also be used to measure movement in retaining walls, cuttings and arches. The Vibrating Wire Soil Extensometer is used to measure lateral deformation in soil and rock, it is commonly used in quarry and mining excavations, as well as embankment monitoring. The instrument is a robust vibrating wire unit and has good long term reliability. 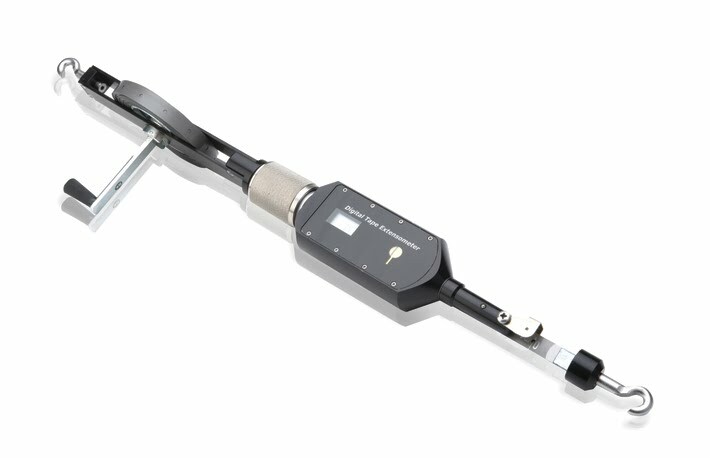 The Rod Extensometer measures lengths between up to 8 anchors and a reference head. This system is typically used to measure settlement and heave in large structures. The rods can be either stainless steel, which have a longer maximum length, or fibreglass, which is quicker to install. 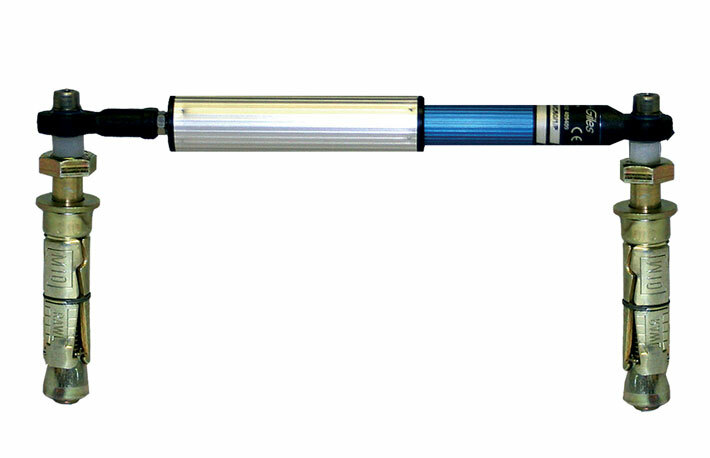 The Continuous Rod Extensometer is similar in operation to the standard Rod Extensometer, it is assembled in the factory to customer specified rod lengths. 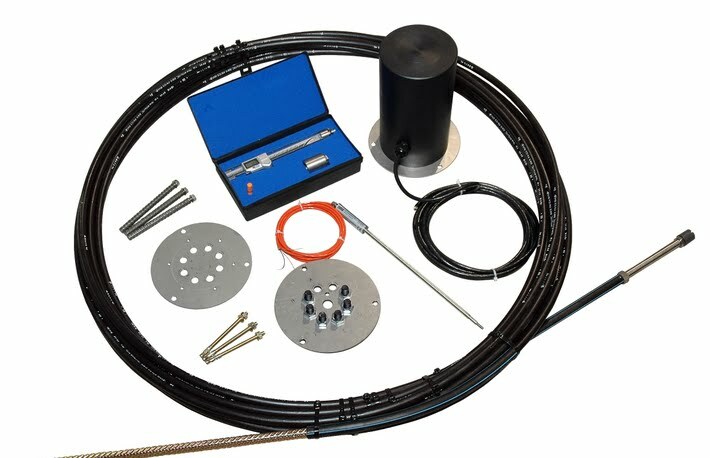 The INCREX system is an Extensometer used in conjunction with Inclinometer Casing to measure ground movement in the direction of the borehole axis. 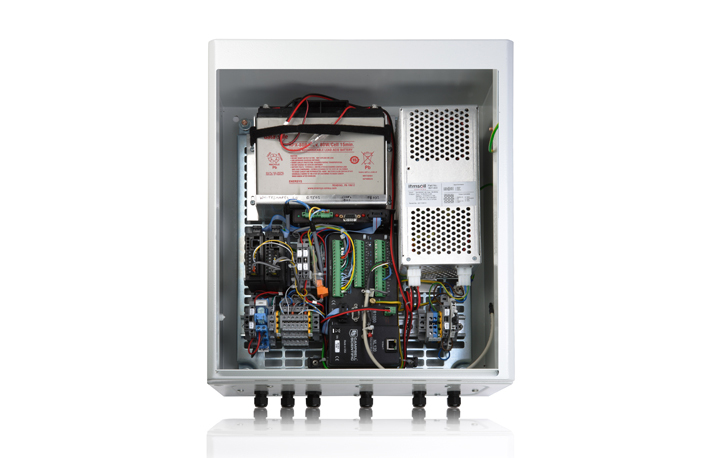 INCREX systems are produced and serviced by Interfels GmbH in Germany. The VW Embedment Jointmeter is designed to monitor movement of joints in mass concrete structures. The system comprises a main body housing the vibrating wire transducer, and a socket. The socket is set into the first lift of concrete, the main body is the screwed into the socket and set into the second lift of concrete. Accuracy is not affected by cable length and the system can accommodate cables in excess of a kilometre. The VW Crackmeter is placed so each end is one side of a crack or joint and it will measure extension or compression of the crack or joint. These instruments are often used on buildings, bridges, dams, pipelines and more. These products are also fitted with a thermistor to monitor temperature. The VW Triaxial Jointmeter measures three way displacement at a joint or crack, it uses Vibrating Wire transducers which measure independent movement irrespective of each other. The system also uses thermistors to measure temperature. The VW Perimetric Jointmeter operates using three Vibrating Wire transducers and a reference anvil design to measure three way displacement at a crack or joint. This system is easy to install and is well suited to concrete installations, especially dam structures. The system also uses thermistors to measure temperature. The Mechanical Triaxial Jointmeter is similar in design to the Vibrating Wire Triaxial Jointmeter, except instead of using Vibrating Wire Transducers, this system is designed to accept micrometers as a measurement device. This system has to be manually measured, as opposed to the automation capabilities of the Vibrating Wire system. 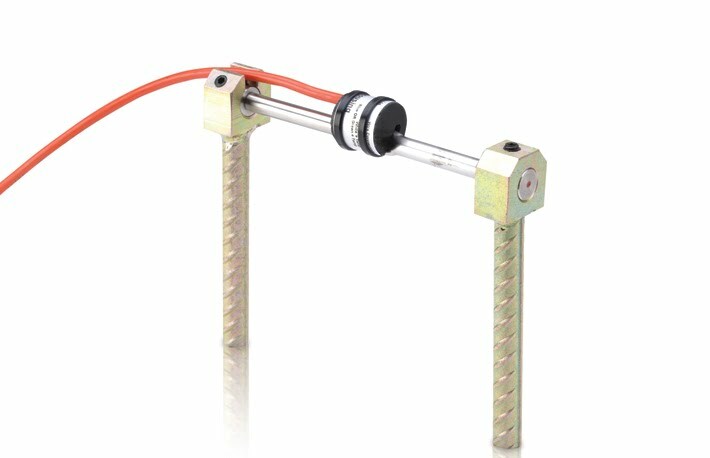 The Linear Potentiometer Crackmeter is a robust system used to measure extension and compression across a crack or joint. It is available in standard and submersible versions and is commonly used in buildings, dams, bridges and pipelines. 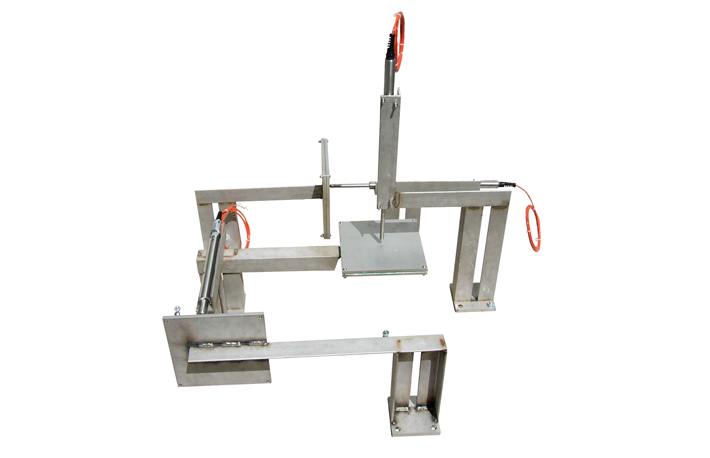 The Vibrating Wire Load Cell is used for measuring loads in rock bolts, cable anchors and tendons, structural beams, piles, loads between tunnel supports and loads in pull-out tests on trial anchors. The system utilises six Vibrating Wire gauges to measure load. 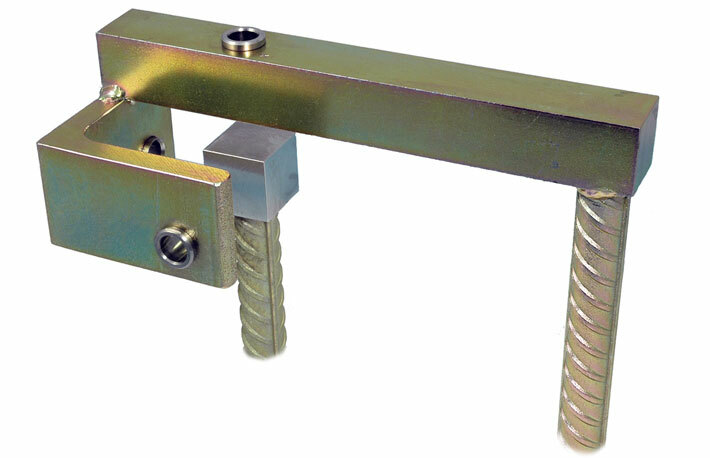 The Strain Gauge Load Cell is used for measuring loads in rock bolts, cable anchors and tendons, structural beams, piles, loads between tunnel supports and loads in pull-out tests on trial anchors. The system utilises up to sixteen Strain Gauges to measure load. The Vibrating Wire Pressure Cell is designed to measure pressure in earth or rockfill. these are often used to measure pressure put on supporting ground by building works and to give adequate warning of unexpected pressure magnitudes. 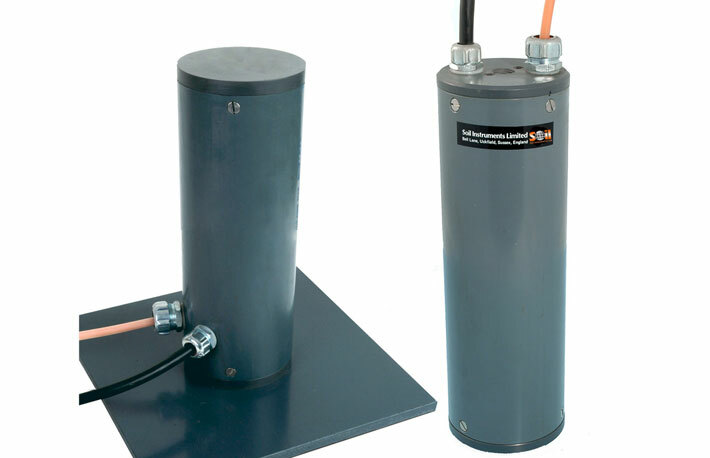 The Vibrating Wire Push-In Pressure Cell is usually installed into vertical boreholes and measure horizontal stress, often installed in stiff and soft clay or glacial till. 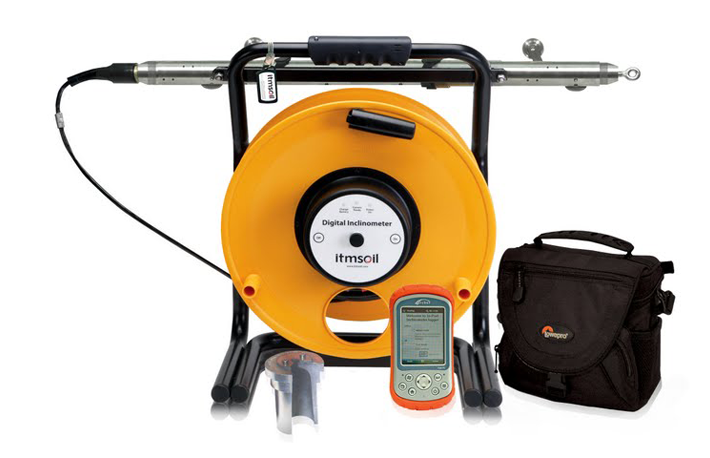 These products are often used to measure stress in retaining walls, embankment dams and sea cliffs. The system also uses an internal thermistor to measure temperature. The Vibrating Wire Concrete Stress Cell is used to measure stresses in tunneling process, mass concreting and rock walls in underground works. The system also uses an internal thermistor to measure temperature. The VWnote is a handheld device designed to measure readings from Vibrating Wire sensors, it allows the user to take readings from most commercially available Vibrating Wire sensors and check the quality of each reading prior to storage. The VWread is a handheld device designed to measure readings from Vibrating Wire sensors, it allows the user to take readings from most commercially available Vibrating Wire sensors. It is an easy to use and versatile readout. 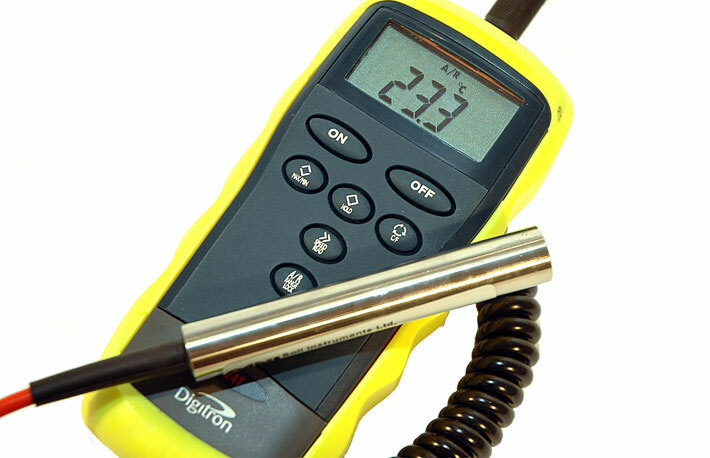 The Vibrating Wire Handheld Readout is a robust portable device designed to read most commercially available Vibrating Wire sensors, it can also connect to terminal boxes and reads Vibrating Wire and thermistor outputs. 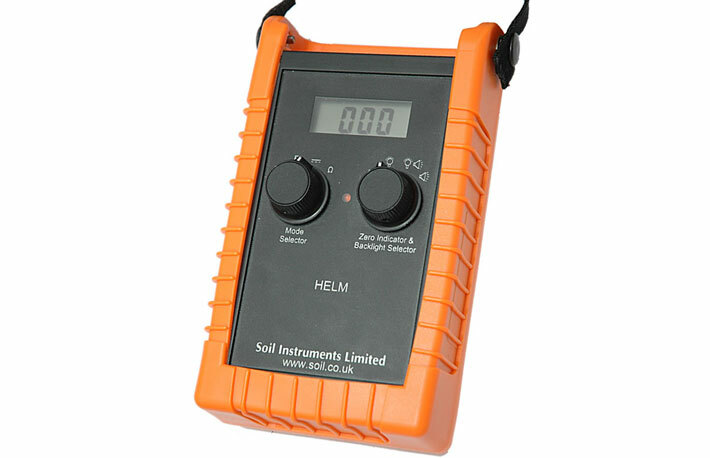 The HELM (Handheld Electrolevel Readout & Multimeter) is designed to read electrolytic sensors and is often used to read Beam and Tilt Electrolevels. Terminal and Junction Boxes are used in projects where integration of cables from multiple instruments in necessary, these boxes are constructed from fibreglass or diecast aluminium and come in a variety of size and switching options. The Hydraulic Overflow Settlement Cell is to remotely measure vertical movement at discrete, inaccessible points. The Vibrating Wire Settlement Cell is used to measure and control settlement of soil at a single point. Datasheet can be downloaded from the web page. The IS Liquid Levelling System precisely monitors settlement comparing pressure values from a variable number of sensors with a reference sensor. The Vibrating Wire Spot Weldable Strain Gauge is used to measure strain in steel members. 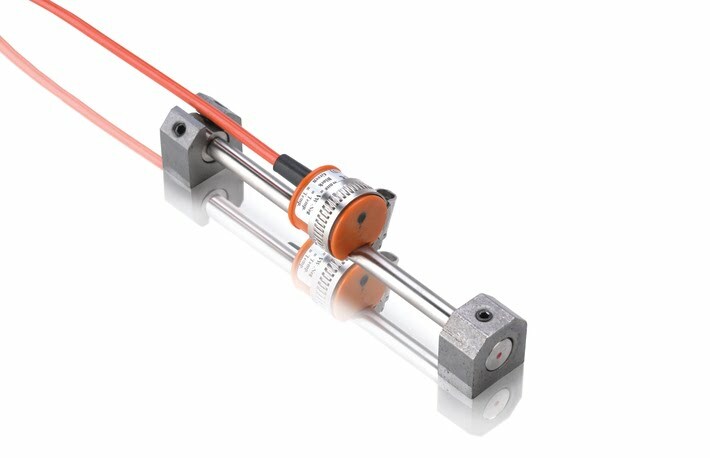 This unit can measure tension or compression and comes with a thermistor for temperature monitoring. The Vibrating Wire Arc Weldable Strain Gauge is used for measuring strain in steel members. The strain gauge can be arc welded to steel structures such as piles, load bearing beams and columns, struts and bridges. It can also be applied to sheet pile walling, reinforcement bars, tunnel linings and suspension bars. The Concrete Surface Mount Strain Gauge measures strain in concrete members. It consists of a coil assembly, Vibrating Wire element and two groutable anchors to embed the unit in the concrete structure to be monitored. O-ring seals between the protective tube and the gauge end blocks provide waterprooﬁng and allow the tube to remain unstressed. The Vibrating Wire Embedment Strain Gauge is used for measuring strain in concrete structures and is suitable for direct burial. It is also used in pile tests, load bearing concrete beams and columns, tunnel segments and concrete foundations. The Vibrating Wire Rebar Strain Gauge measures strain in concrete and consist of a coil assembly and a Vibrating Wire element with rebar extensions at each end. Rebar Strain Gauges are welded into the reinforcing cage and must be matched to the size and grade of the rebar forming the cage. Temperature sensors are used to monitor temperature in concrete, rock and soil, they are ideal for monitoring temperature during concrete curing, for evaluating seasonal variations within ground and structures and to interpret temperature-related stress and volume changes in dams. The Vibrating Wire Temperature Sensor comprises a Stainless Steel body which houses a Vibrating Wire sensor unit/transducer. As the body expands or contracts due to temperature, this changes the tension in the Vibrating Wire. The resulting frequency is converted to output temperature. Thermocouple Temperature Sensors comprise of two dissimilar conductors joined at one end to form a hot junction which produces a voltage. As the junction is heated or cooled the voltage changes and is converted to return the temperature. The Electrolevel Tilt Sensor is based on a proven Fredericks 0711 series electrolevel sensor and measures rotation of structures in the vertical plane. The sensor is housed in a sealed enclosure incorporating an adjustable mounting plate. The measurement of vertical rotation perpendicular to the structure is obtained by using an optional 90 degree angle bracket. The Soil Instruments Bassett Convergence System uses pairs of MEMS servo accelerometer sensors arranged within short and long arms; this provides near real time δx and δz data which in turn is converted to show the deformation in millimetres. The system is supplied complete with a data logger and Soil Instruments software to display data, both as a graphical representation of the tunnel or structure, and also with X and Z graphs for each point. Full user defined alarm functionality can be built into the BCS system. The Digital Portable Tiltmeter is used to measure the angular difference between the sensors axis when held or placed on the X and Y planes of the Tiltplate. Tiltplates are installed either horizontally or vertically on the structure to be monitored and a datum reading is taken from which all subsequent are then compared. Housed within the unit is a MEMS accelerometer that measures the angular position of the Tiltplate and a Bluetooth transmitter that transfers data to the Field PC, resulting in a wireless connection between the instrument and the Field PC. 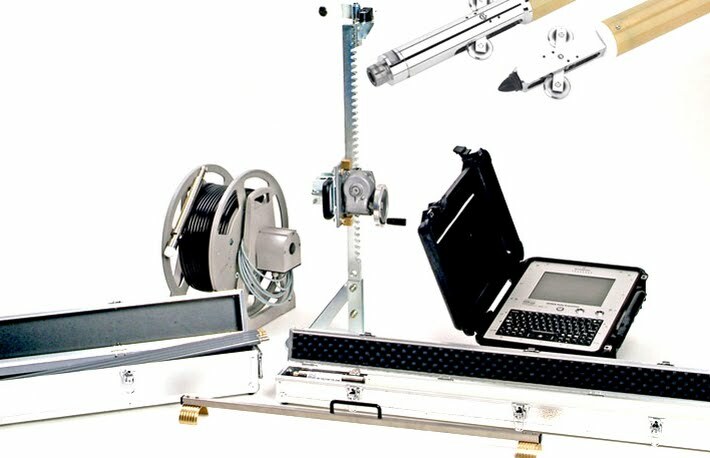 The Field PC is supplied with Soil Instruments ‘Tilt-Port’ software, which permits individual setup of each Tiltplate for easy identification during reading sets. Readings can then be acquired using a remote handheld activator (Key Fob) to record each Tiltplate reading, allowing a history of movement to be quickly and easily acquired. The MEMS Tiltsensor is based on the Soil Instruments In-Place Inclinometer (IPI) sensor and is designed for attaching to structures where a large tilt range is required. Mounted within the Stainless Steel housing are one or two (uniaxial or biaxial) MEMS sensors that deliver a large measuring range with high sensitivity and relative immunity from the effects of long cable lengths. The MEMS Tiltsensor is a small discrete device which measures in g (gravity), providing reliable, accurate and stable data. The Tilt Logger is a standalone MEMS Tiltsensor with integrated datalogger and GSM/GPRS modem that measures the rotation of structures in the vertical plane. The Logger incorporates an intelligent ‘passive’ to ‘active’ alarm system with up to six user defined prioritisation thresholds, reducing battery consumption and an overload of needless data. Logger settings are easily configured by the user, allowing full control of settings and alarms, making the device completely adaptable to site specific changes. 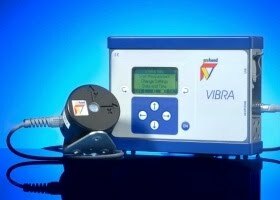 The VIBRA Datasheet can be downloaded from the web page. With a VIBRA Vibration Monitoring System, vibrations that are caused by traffic, pile driving or demolition work can be monitored continually and accurately. By recording the vibrations you can assess the risk of damage to buildings and sensitive equipment as well as the nuisance to people in an objective manner in accordance with the applicable guidelines. During each time interval the Monitoring System measures and records both the maximum vibration levels and the vibration frequencies in x-, y- and z-direction. In addition every hour a full measuring signal of the highest peak value(s) is recorded. The digital signal processing guarantees measurements of a high quality and accuracy. Our assortment comprises the normal Vibration Monitoring System and the Vibration Monitoring System+. 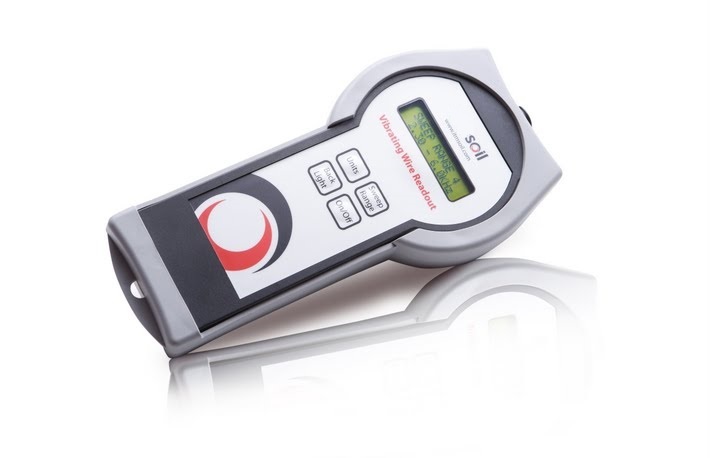 The top of the line the ‘Vibration Monitoring System+' has several special features, including an integrated GPRS/internet option, displacement measurements and automatic level- and calibration checks. The Standpipe Piezometer (also known as a Casagrande Piezometer) is used to monitor piezometric water levels in vertical boreholes. 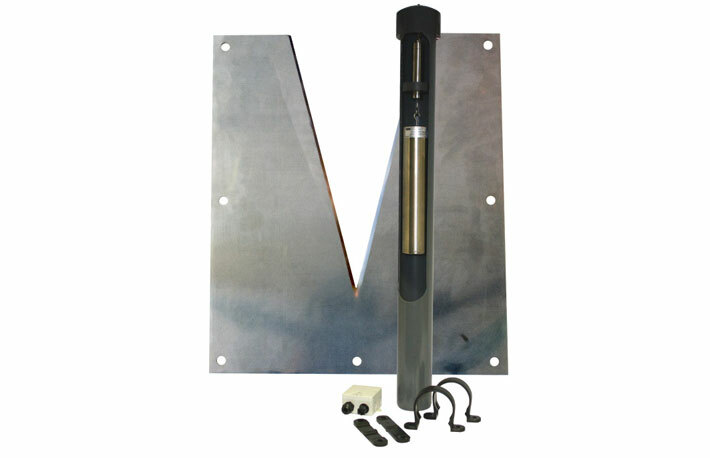 The Standpipe Piezometer typically comprises two parts: at its lowest point is a porous piezometer tip; connected to the tip is a riser pipe which continues upwards out of the top of the borehole. To measure the borehole water level, the filter tip zone is packed with sand and then backfilled above. 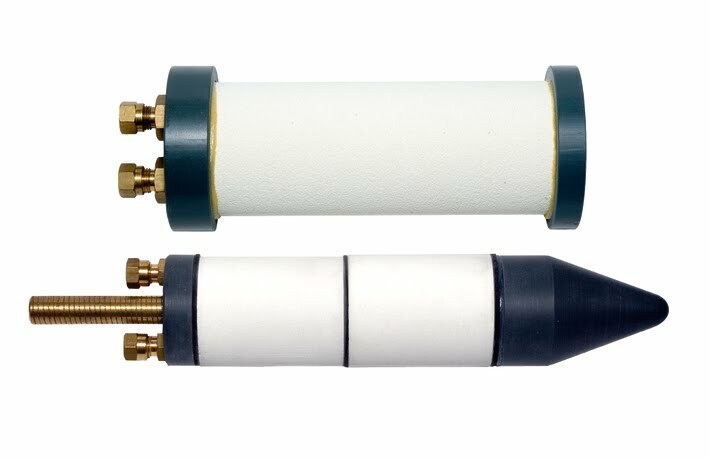 To isolate pore water pressure at the filter tip, a bentonite seal is required between the sand filter zone and the backfill. Alternative filter tip types may be driven or pushed into soft soil, and different tip designs are available to suit various types of ground. The Hydraulic Piezometer is used for accurately measuring pore water pressures in fully or partially saturated soil and rock. 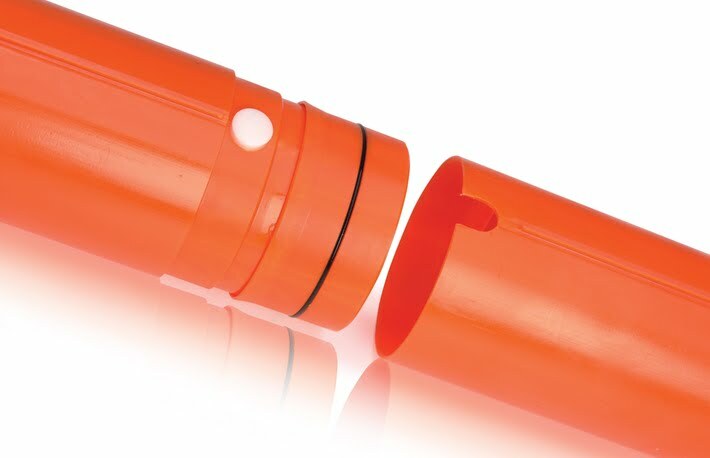 The system comprises a porous ceramic piezometer tip sealed into the measuring horizon and connected to a remote measuring position via twin nylon hydraulically filled tubes. The piezometer measures overall hydraulic pressure from which pore pressures can be calculated. The Pneumatic Piezometer is designed for accurately measuring pore water pressures in fully or partially saturated soil and rock. 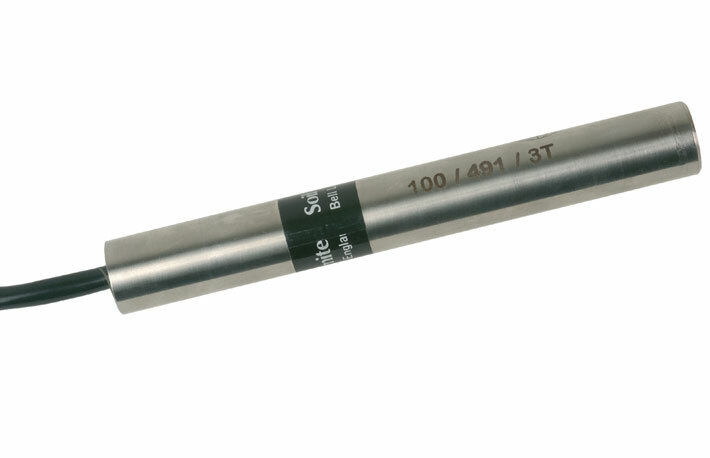 The Pneumatic Piezometer tip comprises an integral porous element with a high quality diaphragm transducer, installed either down a borehole, by burying in fill or by pushing into shallow depths in soft soil. 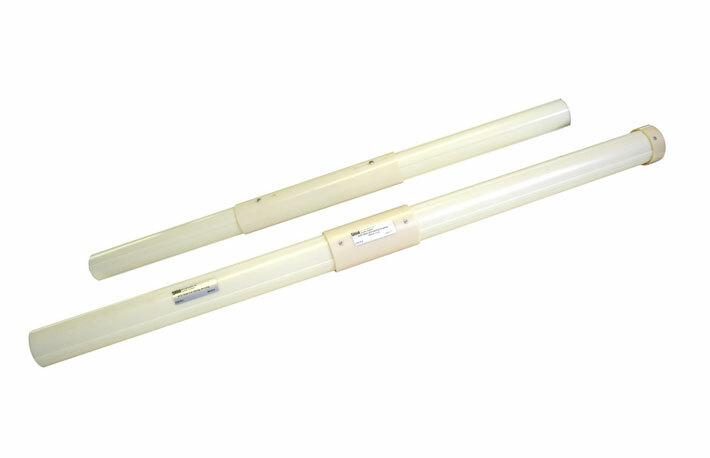 Twin nylon tubes in a polythene sheath can connect the transducer to a terminal panel or to the portable readout unit directly. The Heavy Duty Vibrating Wire Piezometer accurately measures pore water pressures in fully or partially saturated soil. The heavy duty design prevents case stresses from aﬀecting readings in extreme installations (dams and high ground stresses). 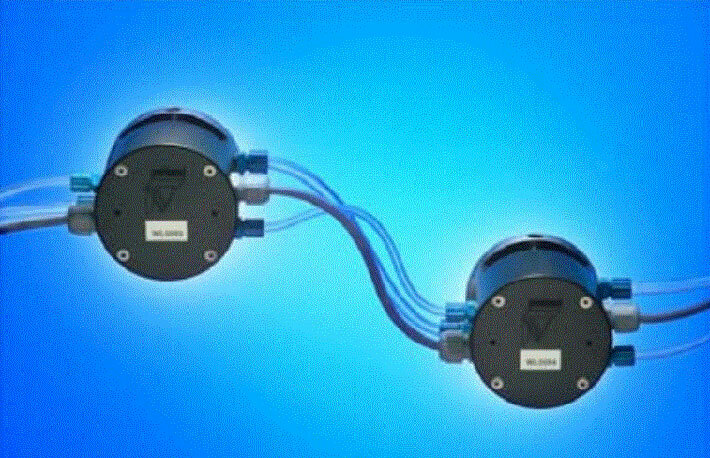 The transducer is ﬁtted with either a low air entry sintered steel or a high air entry ceramic ﬁlter. A cone shaped nose piece is available for push in installations. The transducer is made from high quality 316 grade stainless steel and designed for pressure ranges from -50 to 15,000 kPa. The Heavy Duty Vibrating Wire Piezometer incorporates an over voltage surge arrestor to oﬀer protection from an indirect lightning strike. The piezometer is also available with a thermistor for temperature monitoring. Water Level Meters are used to measure the depth of water in standpipes, wells and boreholes. 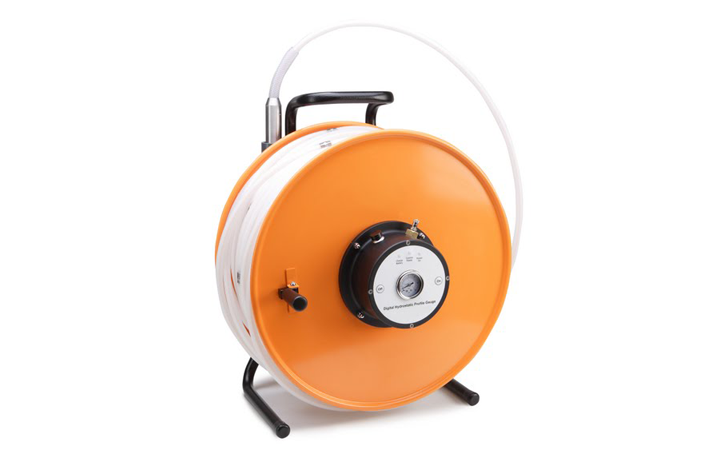 The meter comprises a stainless steel probe fitted to a flexible graduated cable which is wound on a hand reel containing a transistorised switched circuit, audio and visual indicators and a battery. Models with a temperature indicator are optionally available. The Standard Vibrating Wire Piezometer provides accurate measurement of pore water pressures in fully or partially saturated soil. The transducer is made from high quality 316 grade stainless steel and designed to handle pressure ranges from -50 to 4000 kPa. 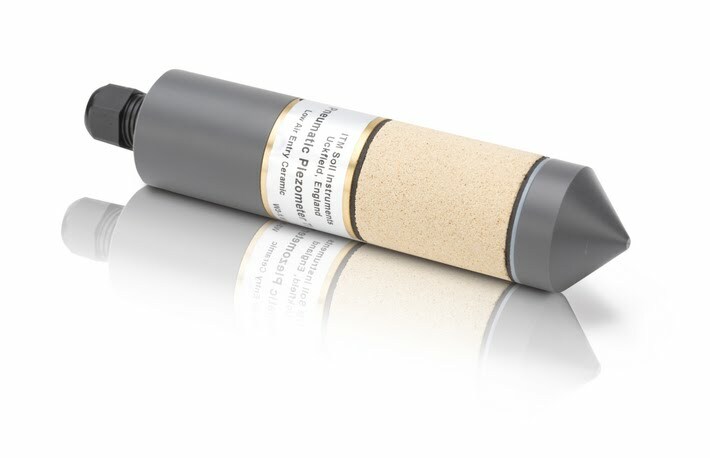 It incorporates an over voltage surge arrestor that oﬀers protection from a lightning strike The piezometer may be ﬁtted with either a low air entry sintered steel or high air entry ceramic ﬁlters. A coned nose piece is available for push in installations. 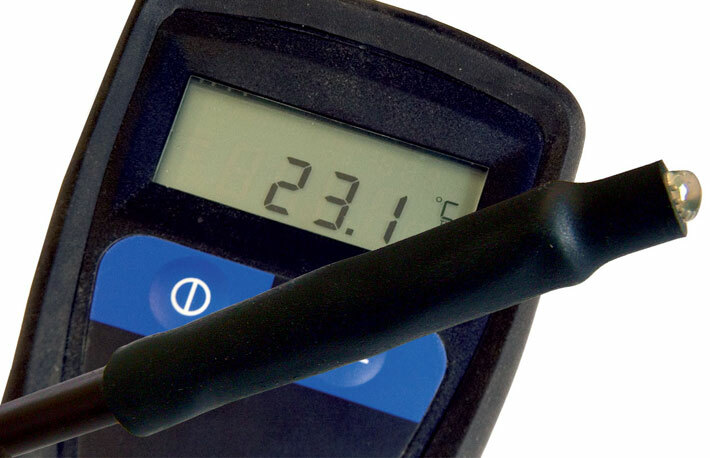 An integral thermistor for temperature monitoring is included. The V-Notch (triangular) Weirs are typically installed in open channels such as streams to determine discharge (flow rate). The main component is a cylindrical weight suspended from a vibrating wire force transducer. As the water level changes, the changing buoyancy force on the cylinder acts directly on a vibrating transducer. The 4-20mA Piezometer is designed for accurately measuring pore water pressures in fully or partially saturated soil and rock. The transducer is fitted with a sintered Stainless Steel filter disc and is available as a vented (gauge) piezometer or a non-vented (absolute) piezometer. 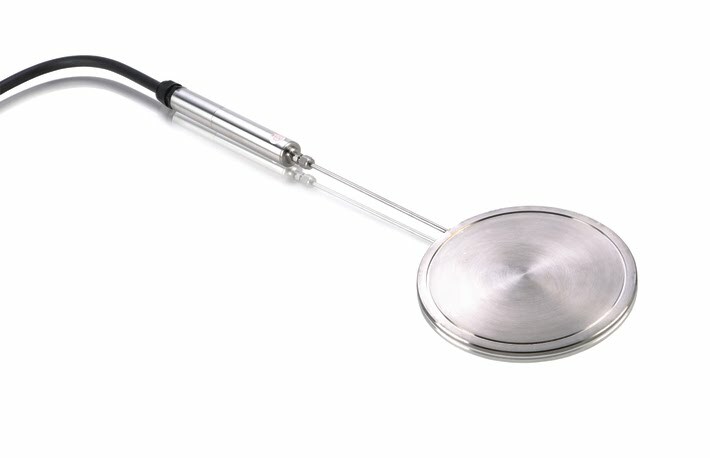 The Piezometer is built from high quality 316 grade Stainless Steel and is fitted with a thermistor for temperature monitoring. 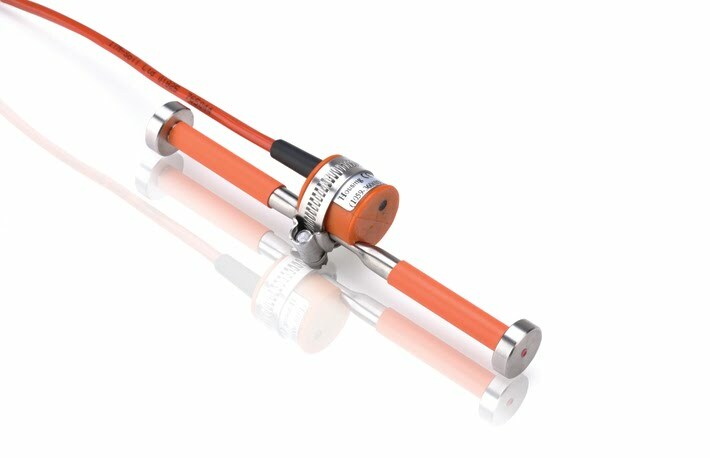 The 4-20mA Piezometer is devised for pressure ranges from -50 to 3500 kPa. Readings are stored on a local SD card and are transmitted in engineering units to any FTP site via the on-board Quad band GSM/GPRS modem. Logger settings are easily configured by the user making the device completely adaptable to site changes. The Logger incorporates an intelligent ‘passive’ to ‘active’ alarm system with up to six user defined prioritisation thresholds, reducing battery consumption and an overload of needless data. The sensor element prevents the inclusion of gases and contains hydrophilic properties that ensure the functionality of the sensor, ensuring low noise levels and excellent stability. The addition of a rain gauge allows correlation between rainfall and ground water level changes. Thanks for the comment, you're absolutely correct. I will change the links to the correct site shortly.